With proper application of a special bonding agent, synthetic eyelashes are attached to natural eyelashes. The look is completely real and natural. 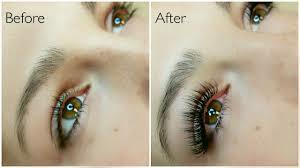 Eyelash extensions will last the length of the natural growth cycle of your eyelashes. Touch-up can be done every 2 weeks or longer. We also can tint your eyelash or eyebrow with the color of your choice.